This was definitely a box ticker for me. It is one that I had wanted to try for a really long time. Having tried the 105, 10, 12, 15, 21, 25 and 30 if was always going to be on my hit list. Nose: Smoky upfront, leather, burnt toffee & liquorice. It smells heavy, dark and rich with damsons and oranges. Palate: Smoky, spicy, leather, sherry, stewed damsons, oranges, Chistmas fruits, and chocolate. Finish: Long, dry, sweet, mildly smoky. This is a great aged expression. First bottled in 2010 it has won it's share of awards and I can see why. For those of you who like myself really enjoy the range of Glenfarclas whisky this is a must try. It is more intense, smoky, leathery and complex than even the 30. If we are talking money then the price for a 40 yr old makes this a bargain. Being truly honest and taking the romance out of it, the the 15 yr old is overall the one I think represents the best value. The 40 yr old however is a wonderful complex and intriguing bottle so if you get the chance... dont miss it. Glenfarclas distillery (the name means “valley of the green grass”) was first granted a license in 1836 after production had arguably been going on at the same site since 1791. In 1865 it was acquired by John Grant and since then has remained in the hands of the same family. At the moment it is run by both the 5th generation (Chairman John L.S. Grant) and the 6th generation (Director of Sales George S. Grant). Glenfarclas uses an unusually large share of sherry butts, mainly Oloroso, in their maturation process. The 40-year old expression was first released in 2010 and has been a part of the distillery’s core range ever since. The nose is rich, distinctly rubbery (in a good way) and displays a whiff of smoke. It is less fruity than I had expected, with prunes and raisins taking center stage, followed by notes of tobacco, bitter chocolate and cinnamon. Right at the end espresso flavours pop up. The palate is medium-bodied, a bit peppery and dry. The prunes and raisins are back, together with tannic and winey flavours. There is also a grassy, herbal side to the palate – rather unexpected, I must say. The finish is long and dry with tannic notes and a whiff of balsamic vinegar. This is a big and assertive whisky, no doubt about that. The nose is simply fabulous, rich in different flavours and super well balanced. Both palate and finish have a less distinct profile, and it was a pleasant surprise to see that this was not as oaky as one might have expected a 40-year old single malt to be. Still, I was slightly confused by the palate’s herbal character and was not too much impressed by the balsamic vinegar right at the end. So, in other words, this worked for me but I was not blown away (try a family cask of similar age instead!). What is mind-boggling, though, is the retail price, given that this goes for only 450 Swiss francs in Zurich (approx. 370 Euros), as similarly aged single malts from other distilleries tend to go for much, much more. Great review. We seem to have a similar opinion about this expression though you seem to have found some herbs in there which evaded me. Unfortunately this was at a tasting so it doesn't seem like I'll be going back to this one in a hurry. At the end of the day, though, I was a touch disappointed. I wanted to it blow me out of the water but it didn't. Same here, @tabarakRazvi. I was not blown away either, although in light of the retail price I was still fine with the overall result. Given the age one would really expect a little bit more. I admit, however, that Glenfarclas is not one of my favourite malts - although I very much appreciate the Grant family's business approach. I had the 40 as part of a comprehensive tasting of the aged offering of this delightful distillery. In the tasting we had the 8-10-12-15-21-25-30-40, as well as the 105. I found the 8-12-21-30-40 to be of similar character, while on one end of the range the 8 is spunky and fresh, on the other end the 40 is rich, smooth and settled. It is a wonderful whisky, to be savored. Nose: The typical Glenfarclas floral, with some added depth, so the obvious sherry with malt, leather, orange and hints of coffee and tobacco. Palate: Slightly oily, caressing, very sweet and smooth. The higher alcohol doesn't assault tongue even when kept in mouth for a long tasting. Finish: Soft linger, some leather and coffee. If pressed, I'd say that the 21 and the 40 are very similar. While the 40 has a depth of residual flavors the 21 lacks, they are more similar than dissimilar, although the 21 would get a lower score by a few points. Nose: Cherry/vanilla-walnut/nectarine, most dominantly. Beyond this, some complex layers can be pulled out: Eucalyptus and fresh red plum flesh. Leather fogs these impressions-- and adds depth. Bold and dynamic. Palate: Leather and caramel, with vanilla. (Just a tad lime rind.) A strong walnut sensation grows from these, meeting a potent & juicy caramel midpalate. Into the finish, more nutty leather, of cashew influence. There is not much for fruit, as the nose suggested, but it is not necessarily missed because of the strength and sophistication of the caramel/nut sensations. Finish: Decrescendos from slightly sweet toffee-walnut to a drier coffee and that elegant leather again. The 40 provides wonderful sensations, with the fewest bitter/sour notes. It may lack palate variety (or the brightness of e.g. the 15), but the flavors compensate with a refined character that is difficult to convey. Perhaps it is enough to say that the strongest flavors hit the right spots of nutty/caramel/vanilla/leather. Whereas I found the 25 and 30 to be similar, I find the 40 has most in common with the 21. The difference is that the 40 is less overtly fruity, instead highlighting other deeper elements such as nuttiness. Ahhhh! I still remember fondly that one sample of Glenfarclas 40 YO which I was able to have. Deep, lush, rich. Great whisky! I try and be as unbiased as I can before tasting a particular whisky lest I am swayed by it's packaging, it's age or glorious reputation. With the Glenfarclas 40 I was face to face with all three. Strong strong sherry with grated ginger on the nose with a dark chocolate pounding. This is followed by dark figs, raisins and dry date husk brought together with a lovely burnt orange spiciness. A familiar, and reassuring, sherry inspired nose. The palate. Oh, the palate. This is what I get for being presumptuous. I was expecting a crisp, full on attack of unexplored adventures instead I received a warm hug of familiarity. The palate is honest to the point of being almost mundane. Almost. The dark fruits, black pepper and maple syrup come together nicely. But nice is all they do. The finish sees off a bit of woody spice and that date husk on the nose. Oh, how I wanted this to sweep me off my feet. Never again. Okay, so in reference to the title, are you saying that you are a "crip, full bodied attack" of a person? I've always prided myself on being as much. As for expensive bottles, I have a friend who wants to split a bottle of Laphroaig 25 year cask strength. What do you think? It is worth it to open that bottle over the holidays? Nose: a very dense liquid, not easy to pick things out at first, needs some time in the glass, old leather armchairs, walnuts, plenty of wood and chocolate raisins, some coffee burnt sugar and maybe lychee? (never said that before). With Water livens things up, gives the dram some energy in the glass, some fresh fruit and vanilla come through and a little bit of toasty-ness. Pallet: leather, old stuff, tannins, oranges in burnt overdone caramel, very rich and meaty, lots of dark chocolate. With Water all the neat pallet is there but now a little more leather and some espresso coffee coming through, as with the nose there is nice vanilla influence on the pallet. Finish: goes a little bit smoky, then caramel pops back and even a tiny bit of fresh Nashi pears, then smoke again, a loooooong finish. With Water bit toastier, bit smokier, bit dryer. Unsurprisingly this whisky needs time, so for any luck bugger out there who gets to drink it, i recommend pouring a dram of this and a dram of something else. Take your time over dram 1 and by the time you have finished the 40 will be ready. Surprisingly this whisky did need water, and a reasonable amount, i added 1 and a half teaspoons, but it responds brilliantly. Beautiful. Where did you taste it? I've had a handful of standard Glenfarclas expressions, and a few Family Casks. The standard expressions left me a bit underwhelmed, though the 105 was really good. It didn't have the old, dark sherry character for obvious reasons, so I passed on it because I could get a similar profile and quality elsewhere. The old Family Casks, though, were great - just prone to the usual variability that single cask expressions bring. The last one that I reviewed had one of the most gorgeous noses, but I just disagreed with the palate. With that, I got to try the standard 40 year old, which, though hardly cheap (~$400), is much more affordable than most other OB 40 year old expressions from other distilleries. Nose: Ah, this is really lovely. Red fruit (berries) are still present, despite the age, along with the usual old 'clean' sherry notes: leather, chocolate, coffee, orange, and some nutmeg. Very elegant. Almost a shame to drink it. Palate: Dark oranges. A bit of leather, and a perfect amount of wood. Fine coffee drops in a chocolate liqueur. Lip-smackingly good. Maybe some nuts and other earthy notes. Finish: More on coffee, dry-dark chocolate, orange, and great wood. Really loving this. A-/A. I got a bottle immediately after tasting it. The only knock that I can think of it is that it's too drinkable, the palate doesn't have the strength that one might want. It's no retiring wall-flower, but it's clearly brought down to 46% and could stand to be a bit higher. All the same, I was dreaming about having more of this for the next week. It's exactly what I imagined the elegant, old, heavily sherried Glenfarclas was supposed to be like. This is my absolute favorite premium whisky. As has already been stated, you almost don't want to drink it, the nose is so good, but to not do so will deprive you of an exquisite taste experience. It's almost like drinking fruitcake. Velvety smooth, fruity and nutty. Yea, you could argue that it lacks any character, but that is one of its strengths. Even many of my non-scotch drinking friends love it. An ideal gift bottle for anyone worthy of the experience. @brian3i, I agree. It's my favorite 'standard' expression of any distillery. It's definitely a premium whisky, and still a bargain by comparison to others of this age and quality. I wouldn't mind drinking this every day (or receiving many gift bottles of it, for that matter). 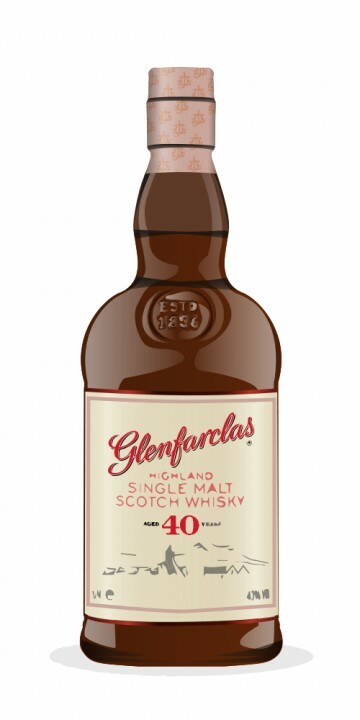 Glenfarclas is one of the few distilleries that offers a 40 Year Old whisky that one can reasonably afford. It is bottled at the drinking strength of 46% and has a great, dark oloroso hue. On the nose I get deep sherry, exactly the way I like it. Juicy and fruity on plums and fresh dades, a marmalade of different kinds of berries and mandora. Wonderful eucalyptus, making it nice and frish. Some marzipan and oak polish. Chewing tobacco and espresso. Pine needles and pine nuts. Salaciously sweet! It is very creamy on the palate, with a feisty attack (black pepper, nutmeg), slightly drying from the sherry and oak, but wonderful on dried fruits like figs and prunes. Turkish delight, dark chocolate, cinnamon and liquorice. This is simply marvelous. The finish is lingering and drying, with a perfect balance between the fruit and the wood. Magnificent Glenfarclas. A 40 year old jewel for a more than acceptable (at least for a 40 year old jewel) price, ranging from 230 EUR to 330 EUR (so it pays – quite literary – to look around before you buy). If you get the chance to taste this one, do not let it pass you by! I've been looking at this one as a little treat to myself for my 40th (next year) following a tip-off from Victor. Your glowing review of it, along with the fact that i've fallen in love with Glenfarclas 175th anniversary edition, removes any remaining doubt. Good work! Yep, I've tried this one. It is not at all bad! (slight understatement there) MOST delicicious. Nose: Blueberry cobbler, juicy cherries, walnuts, pecan pie with vanilla ice cream on top, tobacco, a bit of mint. Wonderful, classic sherry. Very luxurious. Taste: Syrupy, chocolate covered walnuts, sherry, deep candied fruits, sugar and spice, shortbread. Finish: A bit drying with all kinds of tangy fruit jam. Great tobacco finish. This one is an incredibly complex whisky and it is intensely flavorful. At $400-500, this 40 year old is a steal and comes highly recommended. My mouth is watering just writing this review. I totally agree with your points @dbk...The new discussion thread hopefully will be a nice place for people to state the merits of various distilleries. As you may agree, I have no use for having the scoring/rating of individual bottles be affected by perceived value (as pricing and budget can wildly fluctuate from one jurisdiction to another, and from one person to another), any sort of 'value' statement should be just that, as an addendum to tasting notes. My statement was to look at the combination, in a general, across-the-board/big picture, sense, of different factors to debate which distillery acheives the highest regard for their all-around operations and execution. In that regard, my perception is that Glenfarclas is more consistently cited as marrying high quality with a comparatively lower priced product. Your point about someone like Ardbeg having a more diversified range of offerings, while maintaining high quality, is very well taken as a topic of consideration and debate.